Complete an application which will define educational history, college destination, and provide for a release of academic records (high school cumulative g.p.a.). Provide proof of home purchase date and proof of homestead deduction. Demonstrate that he/she resides in an owner-occupied home within Hammond City limits. Proof of home ownership for the purposes of College Bound will require that the parent or legal guardian own a home with a current homestead exemption. Be able to provide proof of legal guardianship in those situations where a natural parent is not the legal guardian. Student eligibility will be impacted by the date in which such guardianship is established. Attend any accredited public or private school. Home-schooled students may apply for the scholarship through the program’s exception process. 10th through 12th grade- Eligible for up to 60% of the scholarship amount. All students of a Hammond homeowner who attends an accredited high school outside of Hammond are eligible for up to 100% of the scholarship providing they meet all other scholarship eligibility requirements (including a valid homestead exemption). Completed an application for financial aid (FAFSA) by the Indiana State deadline, regardless of the student’s eligibility for such assistance, and apply for other scholarships that may be offered. Graduate with a cumulative grade point average (g.p.a.) of 3.0 or higher from a public or private accredited high school. The student must provide a detailed account of all scholarships and financial aid received or applied for including the source and amount of such awards. The student must be enrolled in college credit-producing courses in an undergraduate, degree-seeking program after his/her first year of study. The College Bound Program cannot be utilized towards a graduate degree. A student must maintain at least a 2.0 cumulative grade point average (measured on an annual basis) during four consecutive years of college and release those grades to the College Bound program (A release form will be included as part of the scholarship application). The student must take and earn at least 12 credit hours per semester. Failure to maintain this amount will result in the loss of the scholarship. The student must complete 40 hours of community service and provide a statement of proof that the work was completed. All new students must complete this service by Dec. 31 of their freshmen year of college. 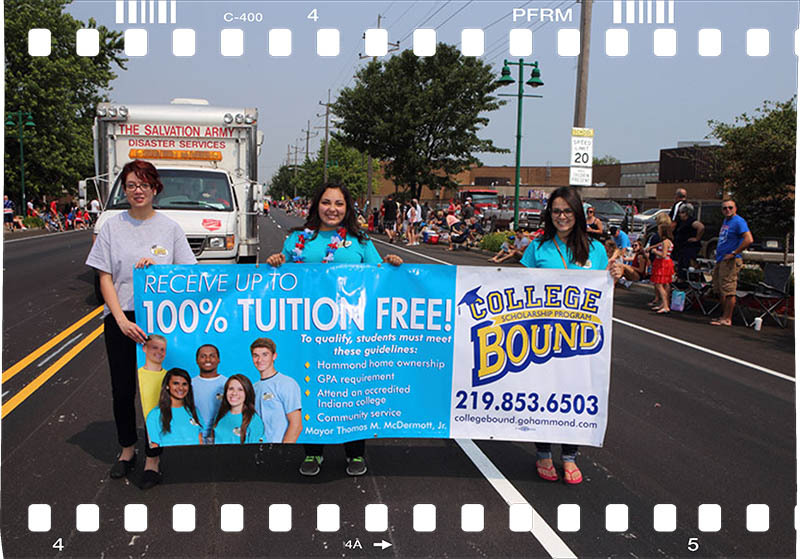 The community service must be approved through the College Bound offices prior to start date. Failure to perform community service hours may result in loss of scholarship and scholarship repayment. The student must reapply each year by July deadline and provide the program with a copy of his/her most recent grade transcripts, proof the student completed FAFSA for the upcoming school year and proof of home residency through homestead exemption. An interruption in the student’s college education lasting more than one semester shall be cause for ineligibility. Once a student becomes ineligible, the student may not rejoin or restart participation in the College Bound program. The student must complete studies within 5 years after high school graduation. The student’s parents must continue to live and maintain home ownership in Hammond (monitored through proof of a homestead exemption) until the student completes his/her fourth year of college. The scholarship will be immediately cancelled should the homeowner move out of the City. At any time, should it be determined that a student has deliberately deceived or provided fraudulent information regarding eligibility, the scholarship offer shall be immediately cancelled or withdrawn, and the student may be subject to legal action to recover any portion of the scholarship that was fraudulently obtained. Copyright © TEXT City of Hammond, Indiana - All Rights Reserved.